You don’t win that many trophies selling more show than go. 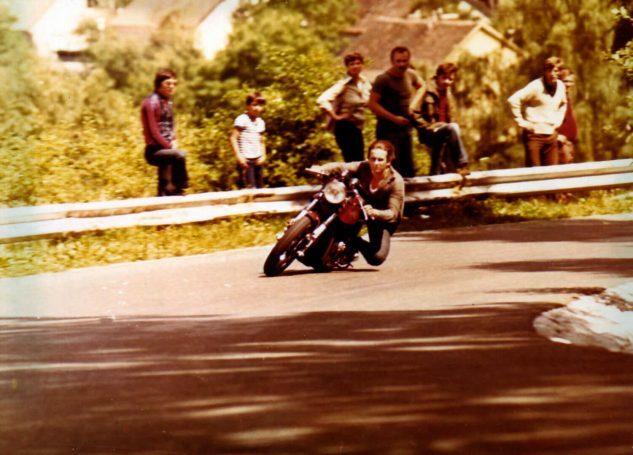 That’s why Slovenian GP and Superbike racer Igor Akrapovič opened a small shop, employing a small number of workers, to build exhausts in 1991. 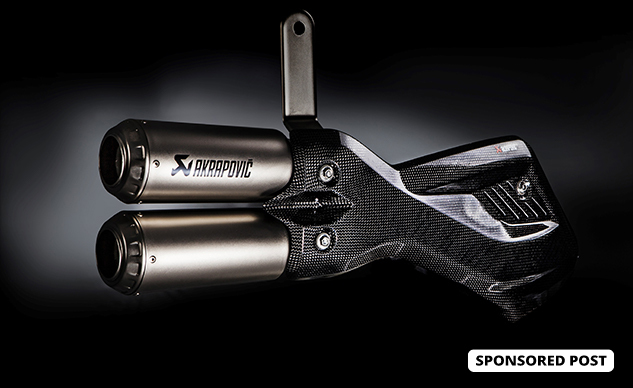 Akrapovič saw the low-quality exhaust systems available to the general public and started selling high-quality mufflers and exhaust systems for the street and racetrack, so even street riders would have access to the same performance, dependability and performance as the professionals. Akrapovič knew he had to keep competing to stay abreast of fast-moving technology, so he kept building and selling class-leading exhausts for racers as well as street riders. By 1996, his reputation for engineering and performance attracted Kawasaki’s World Superbike team; the next year Akrapovič (and Kawi) scored their first victory in WSBK and in 1999 moved its factory to a new – and bigger – location. From the beginning, Akrapovič established itself as a brand pioneer, using innovative technologies in the quest for the lightest weight with the most durable construction and highest performance. That’s as challenging as it sounds, but it’s paid off. Akrapovič was a leader in the use of carbon fiber, superalloys, titanium and innovative muffler shapes, and now leads the way into the future with a new robotic durability dyno at its high-tech facilities in Ivančna Gorica, Slovenia. 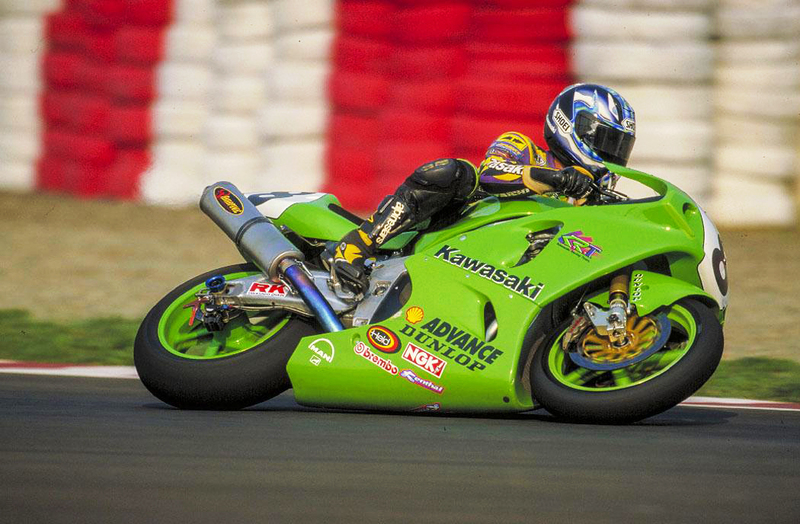 Akira Yanagawa (Kawasaki) scoring a first WSBK win for Akrapovič, 1997. Sensing similar demand in the four-wheel world, Akrapovič moved into Formula One auto racing in 2004. By 2008, the company had scored a victory in the gruelling world of Endurance racing when team Manthey-Racing took the trophy at the 24-Hours of Nürburgring. Other car-racing teams got involved, and by 2012, Akrapovič-equipped Audi R18 e-tron quattro racers took the world championship in the FIA World Endurance Championship; no mean feat, as some of the WEC races pile 1,000 punishing miles on the cars. Akrapovič’s goals of quality construction and high-performance design matter, and now the company is the first choice for riders all over the world seeking more power, better throttle response, less weight and distinctive sound. 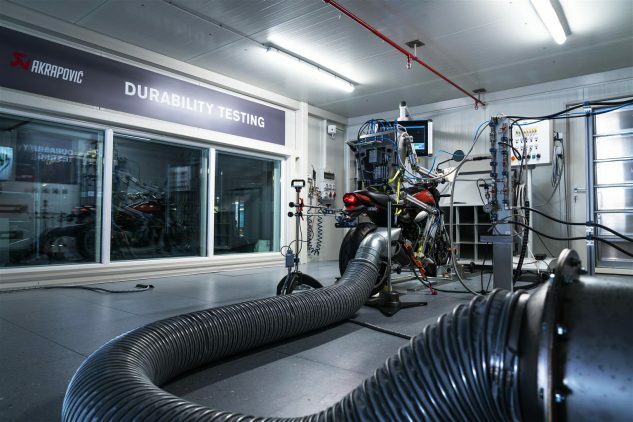 Akrapovič’s high-tech robotic durability dyno is an example of how the company leads the industry. Akrapovič isn’t just remarkable for its racing success; it’s well-known as an innovative and important company by industry groups and the press. In 2014 the prestigious Red Dot: Best of the Best award went to Akrapovič for its Akrapovič Evolution Line (Titanium) for the Ducati 1199 Panigale. Akrapovič also got Red Dots for its special 25th-anniversary logo and the Multistrada Slip-On Line, as well as Best Brand recognition from Germany’s Motorrad magazine – 14 times in a row. Akrapovič is never happy resting on its laurels. Igor Akrapovič compares his company’s story to an endurance race, rather than a sprint, and the company is always looking to expand and develop new technologies. A new factory opened in 2014 and the company employs over 1,200 people and sees sales of over $110,000,000 per year, staggering for an aftermarket company. It’s a remarkable story, how a racer who never thought much beyond winning the next race developed a world-class brand, one of the most recognizable in the motorcycle aftermarket industry.